Skewed BBC Reporting - Surely Not? "So-called "digital competency" involves being able to code and programme computers and skills need to go beyond IT lessons." "An independent review of IT in schools had earlier said computer science lessons needed to be made more relevant to now and the future." What is it with BBC's fixation on coding? Did they actually read the Donaldson review? Did they notice that computer science is certainly included, but under a new area of learning and experience called Science and Technology, which was not mentioned by Huw Lewis yesterday? As I've outlined in several of my last posts digital competence or digital literacy encapsulates a wide variety of skills, knowledge and attitudes that are needed by pupils to successfully navigate through an increasingly digitally connected world - not just coding. You could swear the BBC are trying to skew the news to their own agenda - surely not?! The Micro Bit - Can It Make Us Digital? 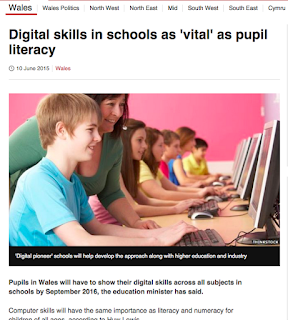 Yesterday the education minister, Huw Lewis, announced that a new digital competence framework for schools in Wales would be available from September 2016. This announcement comes off the back of the Prof. Donaldson report, Successful Futures, and although he hasn't formally responded to the recommendations in the report, the Welsh Government obviously feel that this is a priority and would like to have it implemented as soon as possible. Traditionally the Welsh Government have implemented curriculum changes or frameworks, 'top down'. That is, subject experts writing the new document, then having it piloted by schools, before being pushed out to all schools. However, the development of this new digital competence framework will be developed locally, as suggested in the Donaldson report. “I will therefore be asking our regional consortia to identify a small group of those schools and practitioners already leading the way on the digital agenda so they can help us to design and develop our new Digital Competence Framework, both by drawing on their own experiences and on international best practice. These frameworks in my opinion, should help to guide the Digital Pioneer schools into the appropriate areas. Lots of commonalties across them i.e. communication and collaboration, creativity, problem solving, e-safety / digital citizenship, basic ICT skills. “Our new Digital Competence Framework will be very exciting but it will require us to think carefully about how we support our professionals to deliver in the classroom." In my opinion support will certainly be needed for professionals if they are to successfully deliver a new framework in the classroom. I feel that there could be several areas of any new framework where teachers will need a lot of CPD. It maybe helpful if there was also a digital competence framework aimed specifically at them. Have a look at the work done in Leicester on a framework to support secondary school staff. It could be argued that this is equally as important as a digital competence framework for pupils. Can a teacher support the development of the pupils' competences if they are not skilled or confident in using technologies themselves? When the literacy and numeracy frameworks were introduced in Wales we could probably guarantee that teachers were literate and numerate enough to successfully deliver it. Can the same be said with them all being digitally competent? The other area that needs thinking about, if this is to be delivered successfully in the classroom, are the digital technologies available to the teacher. As it says in the NAACE ICT self review framework are the "ICT resources sufficient in quality,quantity, range, suitability, curriculum choices and are readily available to support learning within and beyond the school." If a secondary school history teacher can only get access to ICT equipment for their classes a couple of times term; or a primary school teacher gets the laptop trolley once a week; or it takes a class 20 minutes to get all the pupils logged onto their devices; or the WiFi connection is unreliable; or the LA is blocking access to certain resources; are the teachers going to be able to successfully deliver the framework? Lots for everyone to think about over the next 12 months. I'm really looking forward to seeing what's produced.